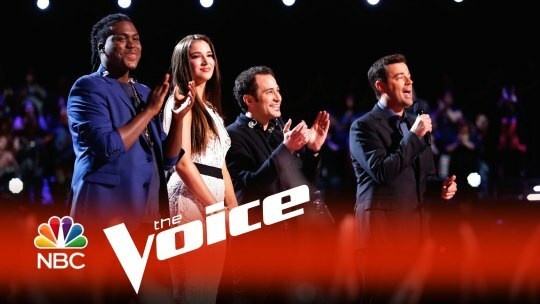 Last week on “The Voice” the Top 10 were revealed after America’s votes were tallied on the live Results show Tuesday night. The lucky winner of Twitter’s Instant Save vote went to Deanna Jonson. During last week’s Results show, we lost artists: Mia Z. from Team Pharrell, and Brian Johnson from Team Adam, while Team Blake and Team Christina remained strong with all artists intact. This week the coaches worked with famous music producers in the attempt to catapult their contestants into the coveted Top 8 which will be revealed after this week’s Results show on Tuesday. Christina enlisted the help of D.J., singer and producer Mark Ronson who produced the hit song “Rehab” by Amy Winehouse, and Bruno Mars’ “Uptown Funk.” Blake brought Scott Hendricks who produced over 80 Top 10 hits and worked with Trace Atkins and Faith Hill among others. Adam’s help came from producer Dave Stewart who worked with The Eurythmics, U2, Stevie Nicks, Mick Jagger. 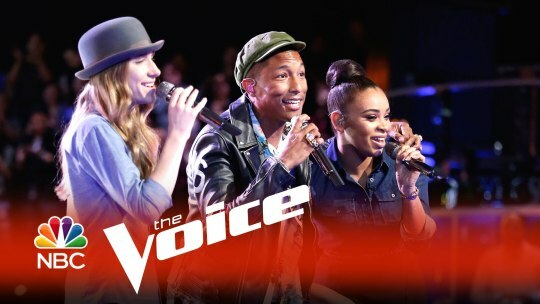 One Republic’s Ryan Tedder returned to The Voice to work with Team Pharrell. His work includes Adele. Taylor Swift, and Beyonce. The Top 10 performed an Elton John medley with some pitchiness here and there notably from Deanna and India. Coaches Comments: Pharrell said she “reinvented what 10 means,” and called it unbelievable. 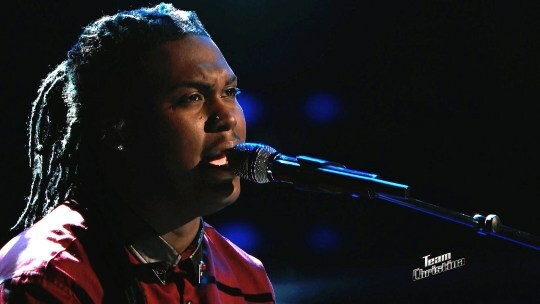 Adam called it “lights out.” He noted that the hardest thing on The Voice is to keep momentum and she’s succeeded. Coach Christina told Kimberly that she can do it all and always slays it, bringing the house down! Rob said his dad who was a church musician, wasn’t around for a large part of his life. Mark Ronson told Rob’s range is extraordinary. Coaches Comments: Pharrell and Christina gave Rob a standing ovation. Pharrell was super-impressive by Rob’s octave range and called it “masterful.” Coach Christina said it opened-up a side of vulnerability from Rob. India said she auditioned for “The Lion King” with the same song, but didn’t get the job. Christina was confident that India would nail the song “with flying colors.” Mark Ronson advised India to put in falsettos into the song and to go off her instinct. Mark said India has a rich voice which is less heard today in Pop Music and it makes her stand-out. Stewart told Josh he has a “good tone that cuts through,” and he’s nervous about his high register. Coaches Comments: Former coach Blake said this song pushed Josh harder than he’s ever been pushed. Pharrell thought it was a good demonstration of Josh’s voice and range. Adam told Josh it was good that he took a risk and it paid off. Adam told her to do the song in a “Florence and the Machine” way. Dave Stewart called her a “soul rock singer” and predicted she’d bring the house down. Coaches Comments: Christina commended Deanna for rising to the challenge and pushing herself. Then just complimented her look. Coach Adam said “it’s been an all-over place kind of road” and that it looked like she was having fun which he was happy about. He also said they accomplished something when she was able to deliver a vocal live without appearing too nervous. Scott Hendricks, who is helping Blake this week, is Blake’s record producer. Hendricks called Hannah a “vocal monster”. 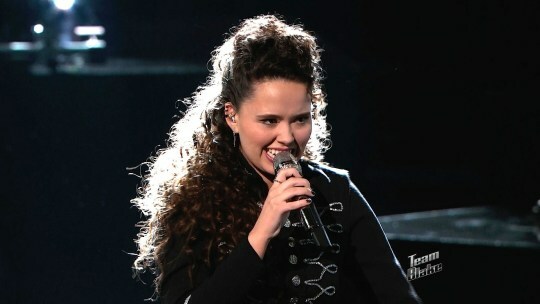 Coaches Comments: Christina told Hannah she is “becoming this super-star person,” and compared her to Janet Jackson. Pharrell said it’s awesome that Hannah makes every song her own and delivers! Coach Blake told Hannah she is a “freak of nature.” He was perplexed how she can give so much energy and is still able to stand on the stage. Blake sang Meghan is going to have to bring out her New Orleans sound like she’s never done before. Coaches Comments: Meghan finished to a standing ovation from all the coaches. Christina called it the best performance that Meghan has done on the show yet. 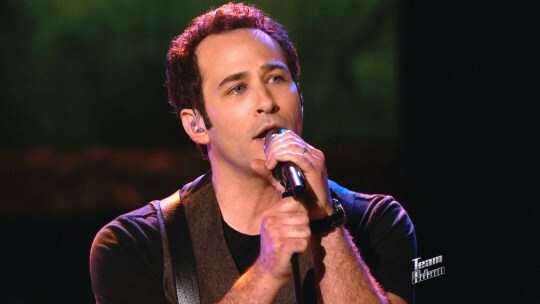 Adam said he was happy she sang Mark Broussard and she blew him away putting her way on the top. Coach Blake recounted how Meghan told him “it’s going to be good tonight.” And it was. Corey is the only Country musician left in the competition. Corey said the song he chose gives him the freedom to do it his way. Scott Hendricks didn’t think that the song fit him and told him the guitar didn’t add anything to his performance. Coaches Comments: Adam said Corey gets better each week. Coach Blake said Corey was incredible and Country music fans caught his lyrical mistake but complimented Corey for working his way through it by pushing through. 16-year-old Koryn chose this song because it’s uplifting and represents struggle and pain. She said it makes her remember when her dad wasn’t there for her and her single mother. Ryan Tedder said the music industry would be lucky to have Koryn. Coaches Comments: Koryn received a standing ovation. Blake reacted by saying this is not the episode of The Voice where you want to slip up. She sang great and told her “welcome to the Top 8.” Christina called it “incredible” and her best performance, and was sad Koryn isn’t on her team. Coach Pharrell said Koryn earned the title of “inspirational singer,” and that everyone felt lifted-up. Sawyer’s song went to number 2 on the Top 10 iTunes which Pharrell was thrilled about. Ryan Tedder envied that. 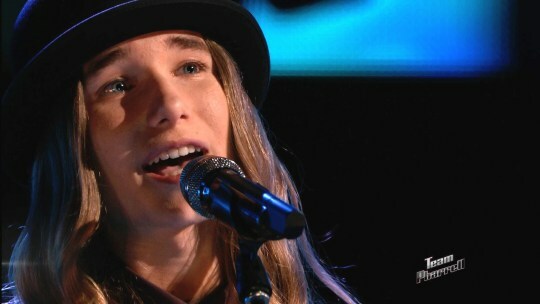 Sawyer chose a love song even though he’s never been in love. Ryan called Sawyer an “anmoliee”. 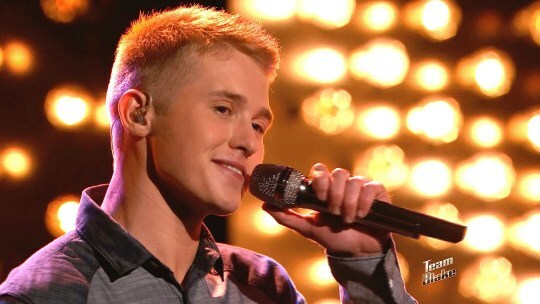 Coaches Comments: Blake told Sawyer his voice is so powerful, loud and raspy. Christina liked that Sawyer tried something new. Coach Pharrell told him congratulations with the big voice going from “0 to 60” in seconds. 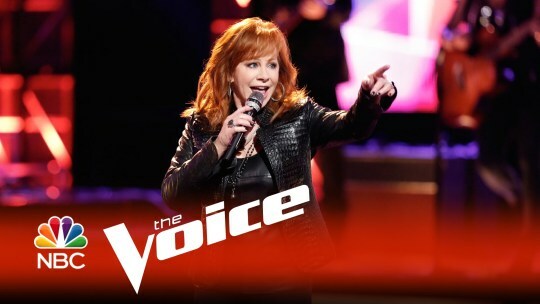 Reba returned to The Voice to sing her new single “Going Out Like That.” But, first, Koryn Hawthorne and Sawyer Fredericks opened the show with their coach Pharrell Williams singing “I Don’t Wanna Be”. 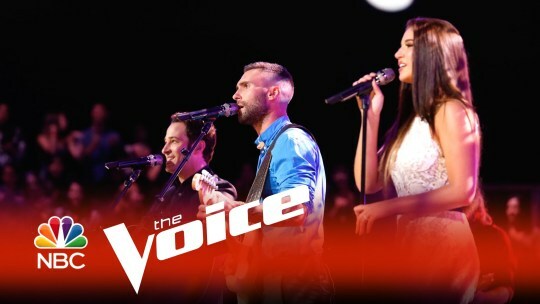 The first two artists that were announced as “safe” by The Voice host Carson Daly were Koryn Hawthrone (Team Pharrell) and Corey Kent White (Team Blake). Blake could be heard saying “We’ve got a plan now too” to Corey. NEXT WEEK: Past coaches will return to help advise the Top 8. Usher will advise Team Adam. Pharrell will be joined by Gwen Stefani. Team Christina will also have the help of Gwen. Cee Lo Green will advise Team Blake who Blake said he misses and can’t wait to see what his contestants will be wearing. Daly noted that Shakira won’t return because she is busy with her family in Spain, but sends her love. 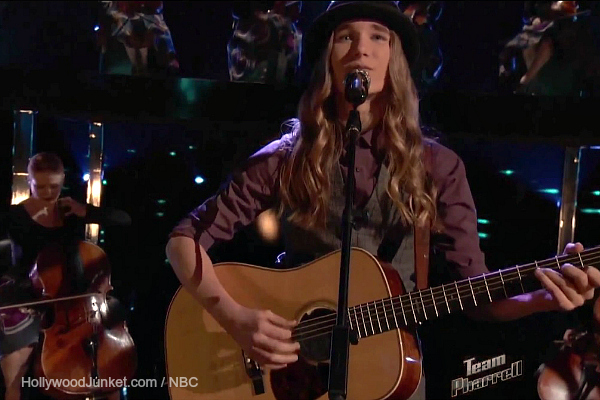 Next, America saved Sawyer Fredericks (Team Pharrell) making coach Pharrell’s artists completely part of the Top 8. 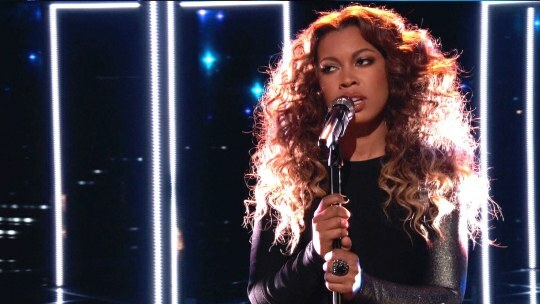 India Carney (Team Christina) was the next artist announced as moving to the Top 8. 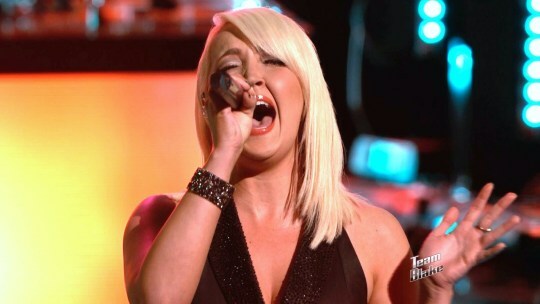 More artists announced as “saved” by America were Meghan Linsey (Team Blake), and Kimberly Nichole (Team Christina). 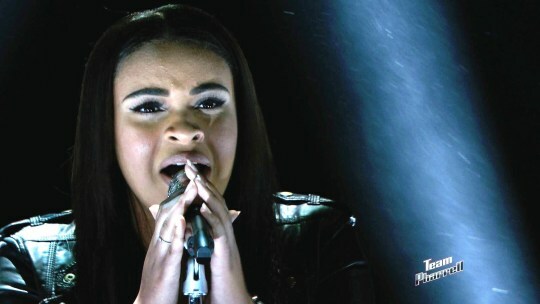 After Team Adam performed “The Joker” by Steve Miller Band with their coach for the first time, the last artist to be saved by America’s votes was Hannah Kirby (Team Blake) making all three of Blake’s artists moving on to the Top 8. That left Rob Taylor, Deanna Johnson and Joshua Davis in the Bottom Three and up for the “Instant Save” vote via Twitter. Christina called Rob “an important part of this competition,” and knows that he is a super-star. Adam had two artists in the Bottom Three. He said that his team is “struggling right now” and they haven’t seen the best from his team yet. After the commercial break, the percentage of Twitter votes were shown as: Rob with 21%, Deanna with 31%, and Joshua Davis winning with 45% of the total votes. Adam called it the “hardest part of the show” for the contestants, and can’t imagine what the pressure is like for them. The INSTANT SAVE went to Joshua Davis from Team Adam. 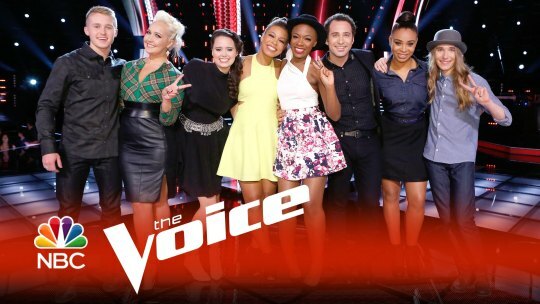 THE VOICE TOP 8 (l-r): Corey Kent White, Meghan Linsey, Hannah Kirby, India Carny, Kimberly Nichole, Joshua Davis , Koryn Hawthorne, Sawyer Fredericks.